There's a very distinctive type of slow-burning film direction these days when the person behind the camera allows the scene to linger for a moment too long, giving the audience a moment to reflect on the image or the situation in question. In many cases, it's a sign of confident pacing, and can allow the viewer a quiet moment of reflection before the narrative moves on. Problems arise, though, when the situation isn't very interesting in the first place. Enter Archipelago, director Joanna Hogg's second film and my personal introduction to her work. It's the story of an upper class twits family taking a brief vacation on an archipelago before the son Edward (Tom Hiddleston) departs on a volunteer gap year in Africa. Joining him are his mother Patricia (Kate Fahey) and bitter sister Cynthia (Lydia Leonard). The father of the family is notably absent, away on business we gather through one-sided phonecalls and conversational snippets. Also in the house is hired caterer Rose (Amy Lloyd) and frequent visitor and painting instructor Christopher (Christopher Baker). Over the course of a few days we're meant to experience the conflicts and dynamics of this family, where everything isn't as smooth as one might expect from a group of seemingly intelligent adults. This is one slllloooowwww film, and that way by design. And the considered pacing is admirable - Hogg has considerable control over the flow of her film and narrative. It's filmed pleasantly, often from a distance, as if we're a silent observer on events. The significant flaw, though, is that it's difficult to care for these events or people. The family for the most part are arrogant, spoilt members of an upper class I found near impossible to relate to. Many of their concerns are trivial and uninteresting. Hogg attended the screening I was at, and noted how she left gaps in the story for the viewer to fill in themselves. Again, said gaps are dull and unimportant. Yeah, they're all angry their father / husband / girlfriend isn't here for a variety of slowly unveiled reasons, but why should I care? The concerns of this family and their few companions aren't original nor insightful enough to justify the long pauses between scenes. Cynthia is a particularly horrid character here - her childish arrogance and selfishness makes her an unlikable screen presence even when with the hints of why she is that way. 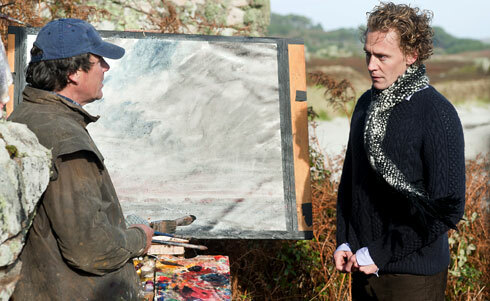 Christopher - Baker being a non-actor and painter himself - is another unwelcome addition to the cast. The lack of acting ability (a lot of stumbled sentences) would be fine if he had anything of interest to say, but the trite advice and painting analogies he dispenses are obnoxious and a bit in-your-face for a film priding itself on subtlety of delivery. Likewise the occasional bit of lingering symbolism is rarely enlightening. There are plenty of films where nothing happens interestingly and sometimes beautifully, but Archipelago is rarely one of those films. There are a handful of moments of cringe-worthy comedy - a restaurant excursion is hard to watch - that may elicit the odd chuckle, but for the most part we just get repetitive awkward silences and dinner table fights. Edward and Rose are the only characters I felt any empathy for. Edward admirably shows some moral backbone despite having to put up with the judgements and petty squabbles of his family members. Rose I only felt sympathy for because she has to work under and experience the actions of these ghastly people. I can see why the non-family members resort to awkward silences and shallow conversational topics. Hogg does show a confidence of sorts behind the camera, and I appreciate her efforts. But even though I feel like I have a decent attention span for slow-burning drama, the lack of emotional payoffs or insight for spending two hours with these characters was a severe disappointment. It's like Autumn Sonata without the hypnotic Bergman intensity, or a mumblecore film featuring only wealthy, spoilt children. The non-actors in the cast bring little credibility to the table: while the non-professional Lloyd is likable as the caterer, it's only the professional Hiddleston whose emotional turmoil feels engaging and real. The funereal pacing here though is the biggest downfall - too many moments where the audience is forced to reflect on deeply uninteresting concerns. Like the characters throughout the film, this is one archipelago I was itching to leave.